Six music cassettes with 9 hours of music. 3 songs (rough versions) from the upcoming "Guitarmageddon" album; including "Brainsaw". 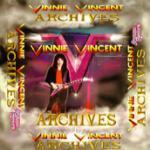 Vinnie Vincent Invasion live performances and rehearsals. Warrior demo's with Vinnie singing. The Ballads of Vinnie Vincent (a 20 track ballad tape) including the original version of "Back On The Streets", "I Need Love" originally recorded for Lick It Up, later changed to "Shoot U Full Of Love". Unedited versions of "Ashes To Ashes" and "That Time Of Year" with the original guitar solo's. 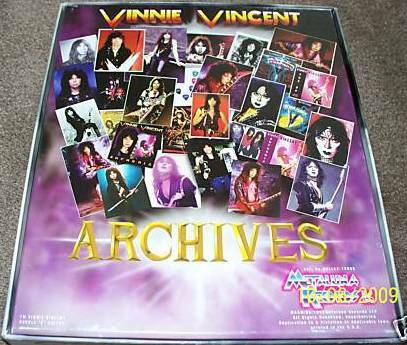 The original demos of Vinnie Vincent for Chrysalis Records ; "Boys are Gonna Rock", "Shoot u Full Of Love", "No Substitute". a 50 minute rehearsal Jam session from 1986 which incl. the instrumental "Speedball". 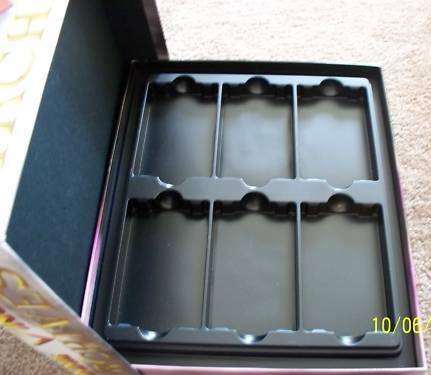 Below are a couple of images of the never released box set. The box was already printed , but for various reasons (for example the rights for using KISS and KISS related songs) the project was stopped at the last minute.